I’m getting married in the morning. Ding Dong the bells are going to chime. There are many important aspects to a wedding. The venue, the guests, catering and of course THE DRESS! Choosing a dress can take quite a long time and can prove to be somewhat stressful. But what if it didn’t have to be? Lace and Pearl Bridal Boutique is a wedding dress store based just outside of Oakham. Naomi and her team have been supplying local brides with stunning dresses since 2015. These guys are no ordinary bridal store, oh no. Lace and Pearl Bridal Boutique are a one-stop shop for attire and accessories too. These handmade accessories include tiaras, fascinators and wrist corsages to name a few. Need a hand with the bridal party outfits? It can often be tricky to imagine what you and your bridesmaids are going to look like all together on your big day. Well, at Lace and Pearl Bridal Boutique you can bring your bridesmaids and their dresses with you to see the whole look. The team will be on call to help you if you aren’t entirely happy too. To make your wedding dress experience that little more bespoke, Lace and Pearl Bridal Boutique offer a bespoke wedding dress ‘on the day’ service. On the morning of your wedding, the team will help you and your bridesmaids with your dresses. They will also make any minor changes to your dresses if needed. Usually, the process of choosing your dress can take a long time. Finding the right size and fit can be tricky and, often, a lot of timely adjustments are made which can take months. At Lace and Pearl Bridal Boutique, they have dresses in a range of sizes, allowing you to walk out with your dress on the same day you walked in, should you wish! Where do the chimps come in? Lace and Pearl Bridal Boutique approached us as they were looking to do things differently when it came to serving drinks. 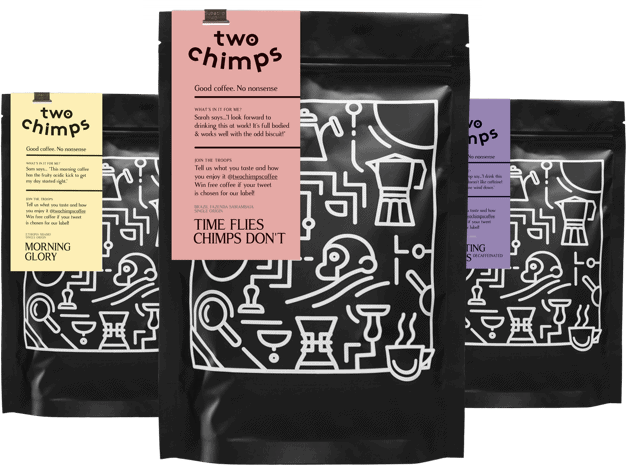 Instead of offering their clients champagne or prosecco when choosing their dress, they offer them Two Chimps Coffee – Yum! Currently, they offer their clients our moreish and soft decaffeinated coffee ‘Knickers & Gnomes’ from Rwanda, along with our smooth and creamy ‘all day’ coffee ‘How Many Is A Brazilian’ from Brazil. Naomi and the team use a cafetiere to brew their coffee too. Along with their new offering of speciality coffee, they also offer their customers lose leaf breakfast tea. Brewed using a see-through teapot, you can see the whole brewing process taking place. Mesmerising. Lace and Pearl Bridal Boutique order their coffee as and when they need it. When required, we roast their coffee to order, allowing the coffee to stay as fresh as possible for their clients. Fancy a cup? Grab one of our samples to kickstart your love for speciality coffee.